In 2015 in the U.S.
An estimated 54% of dogs were overweight or obese. An estimated 59% of cats were overweight or obese. And that’s just a partial list. To see a more complete list of pet health problems caused by being overweight, see this Canadian Veterinary Medical Association page. As one would think, lack of exercise and overfeeding combine to cause a dog or cat to be overweight. A little extra food and a little bit too much Netflix’ing with the owner, all over an extended period of time, will cause your pet to be overweight. 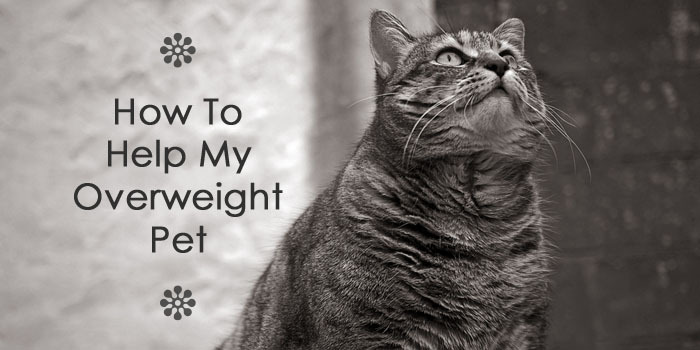 How do you know if your pet is starting to be overweight? If you look at your cat or dog from above, your pet’s body should have an hourglass shape, the last rib (roughly the centre of the body) being the widest section. From there, he should get narrower through the waist, until he again gets bigger at the hips. You should be able to easily feel your animal’s ribs and spine with your hands. A contributing factor is that many pet owners prefer to remain in some form of denial when it comes to the weight of their pets. They don’t think it’s an issue or simply refuse to acknowledge that Fluffy has fluffed out a bit too much in her mid-section. There are some medical issues which may be causing weight gain, including hormonal issues, water retention, parasites, drug side-effects and of course, pregnancy, so it is wise to be thorough in your observation and determination of the cause of the extra weight. How can we help our pets stay fit? Weighing or measuring the food you give your pet is the most effective thing you can do to regulate caloric intake. While there are many methods and no set rules about how much raw/dry/moist food to give your dog, experiment with portion sizes, taking care not to rush the process. Keep in mind that weight loss should be restricted to less than 2% of body weight per week. If you have a 50lb dog, this means that he should lose no more than 1 pound per week. If you have a 15lb dog, weight loss should be no more than 1/3 of a pound per week. Our pets require very little carbs from their food. A diet high on protein and fats and low on carbs is nutritionally sound and will also help your dog and cat stay at an optimum weight. Yet commercially made kibble has up to 4x the amount of carbs that are necessary and healthy for our pets. Manufacturers include a high percentage of carbs in their pet foods not for nutrition, but because it makes their products easier and cheaper to produce. Factor in “treats” which are largely carb-based and we can understand why there are so many pudgy pets around. Take notice of the amount of carbohydrates you are feeding your pet. Meat based proteins will provide a better balance of nutrients (minus the unnecessary carbs). Our pet’s physical exercise habits will likely mirror our own, so if you come home from work, grab some quick and perhaps unhealthy food, and flop in front of the TV or computer, without getting some substantial exercise, a lack of vitality and excess weight will result (for the both of you). It’s so easy to simply take your dog out for a potty break, without going for an extended walk. Regular exercise will keep your dog both physically and psychologically fit. Boredom and over-eating go hand in hand. Exercise increases the metabolism and of course…burns calories. Consider supplementing your pet’s diet with a product designed to support weight control and overall nutrition. Our GMO-Free BioSLIM supports healthy blood sugar activity, breaks down and expels an overabundance of starches and supports healthy thyroid and pancreatic function, digestion and metabolism. This supplement can be added to any existing diet– raw, dry or moist.